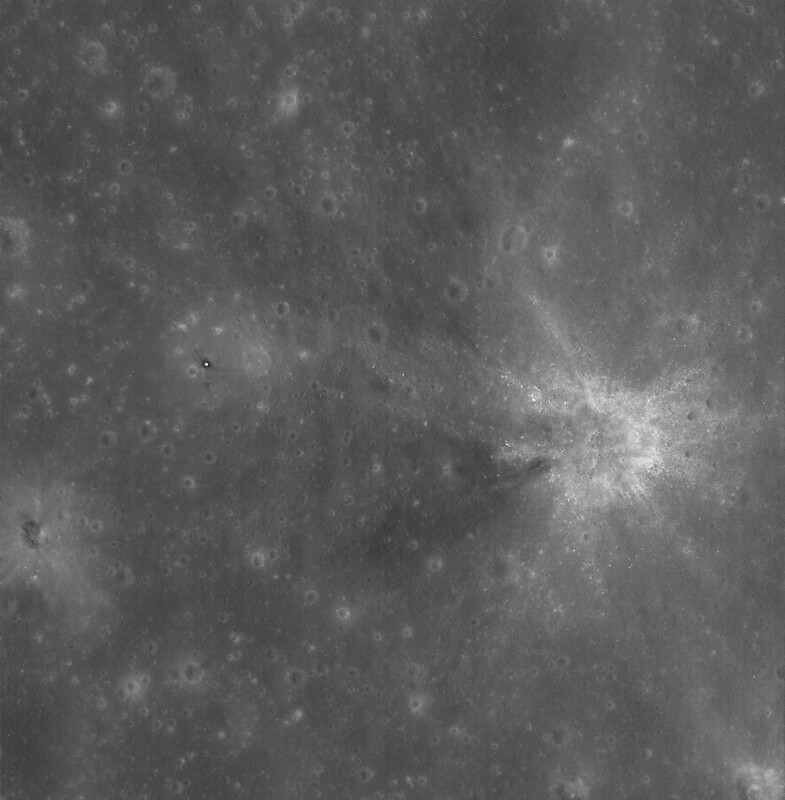 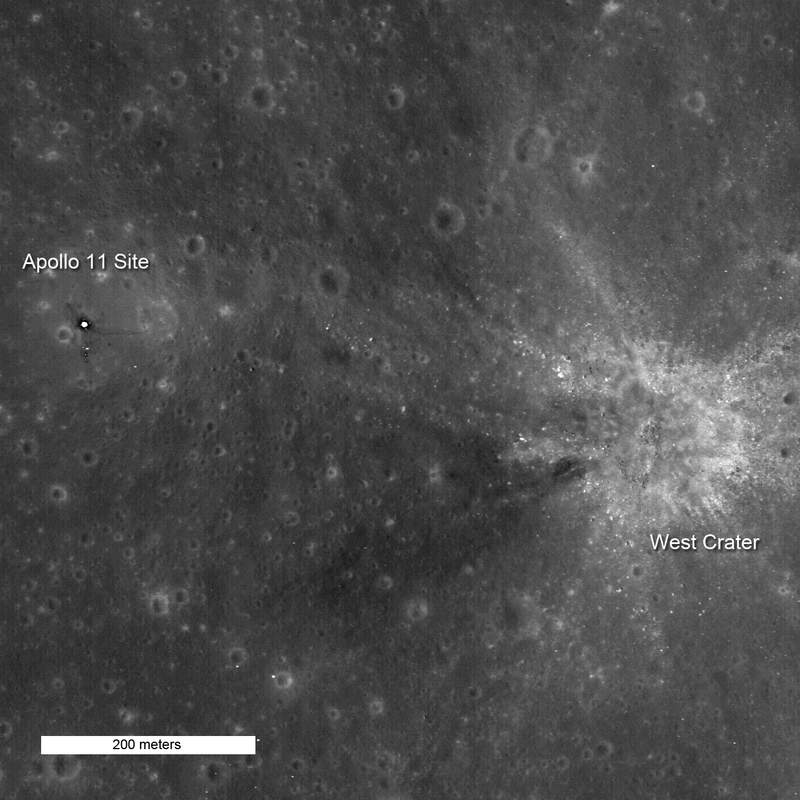 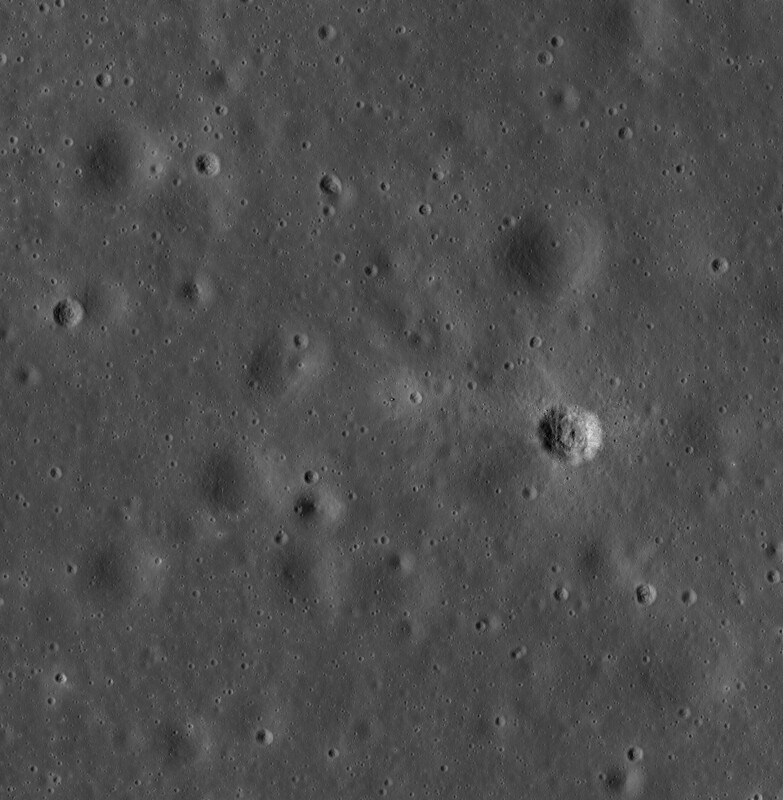 Following are deconvolved and enhanced versions of the raw LRO images of the Apollo 11 landing site. These deconvolved and enhanced LRO images show considerably more detail in comparison to the LRO's raw images. The raw LRO images, merely with adjustments to brightness and contrast, are what have been published by both Arizona State University and NASA. 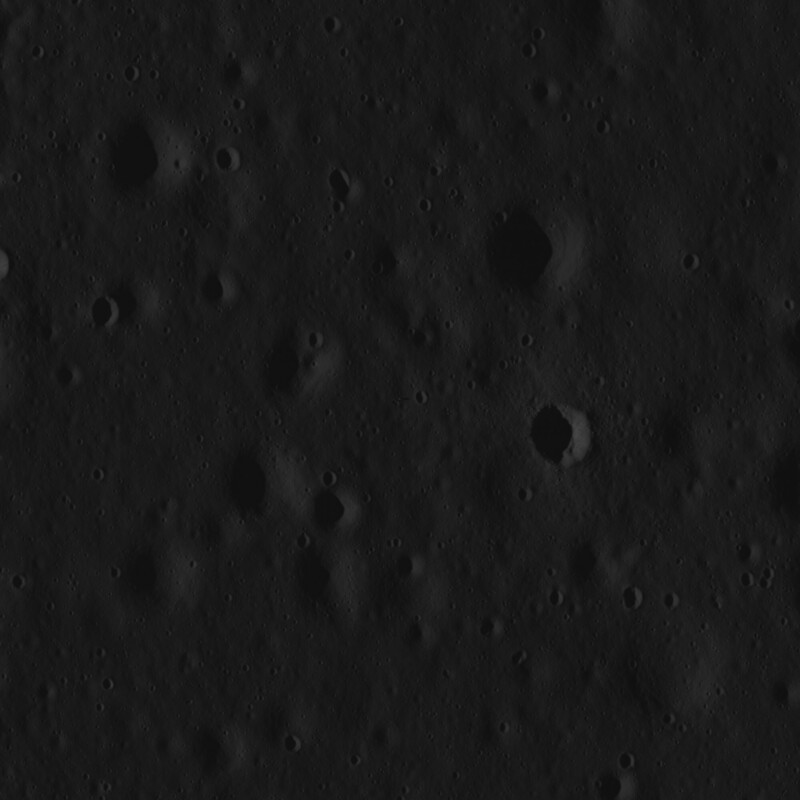 All of GoneToPlaid's deconvolved and enhanced images, after processing, were then resampled to have identical image scales along the X and Y axes. Horizontal versus vertical image scale accuracy is in the neighborhood of 2%. 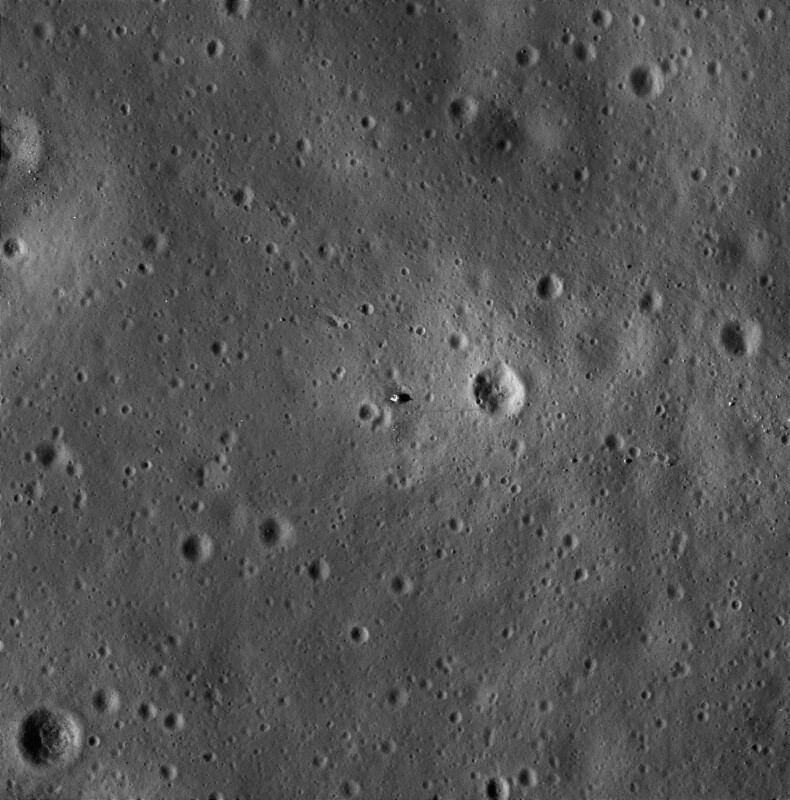 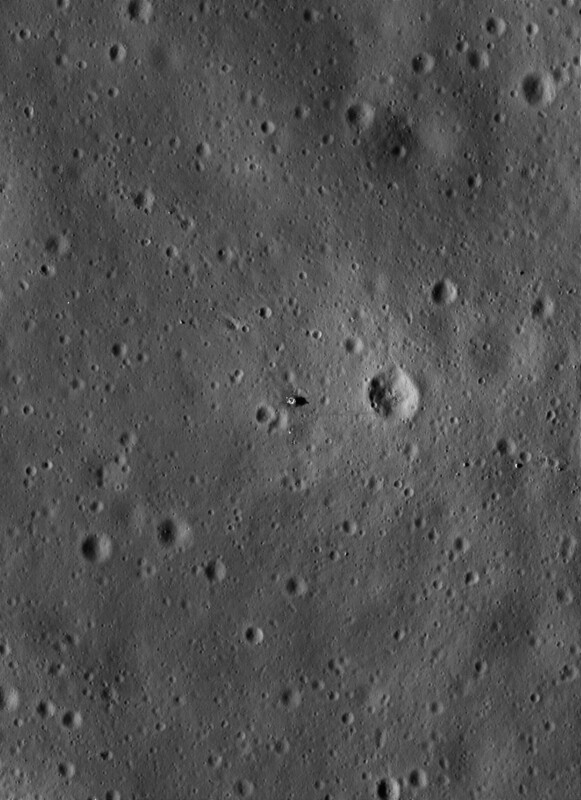 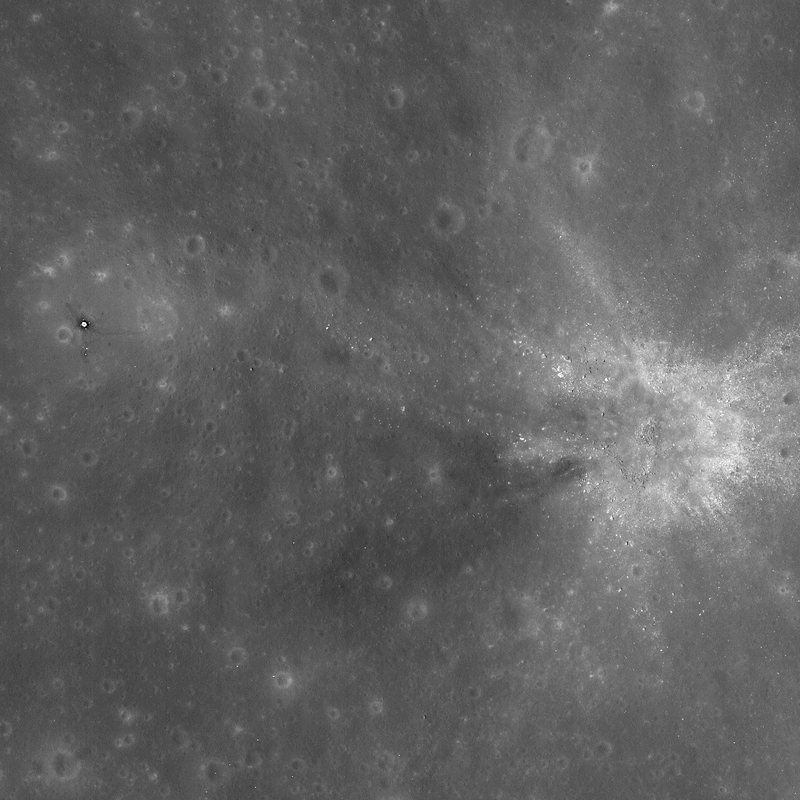 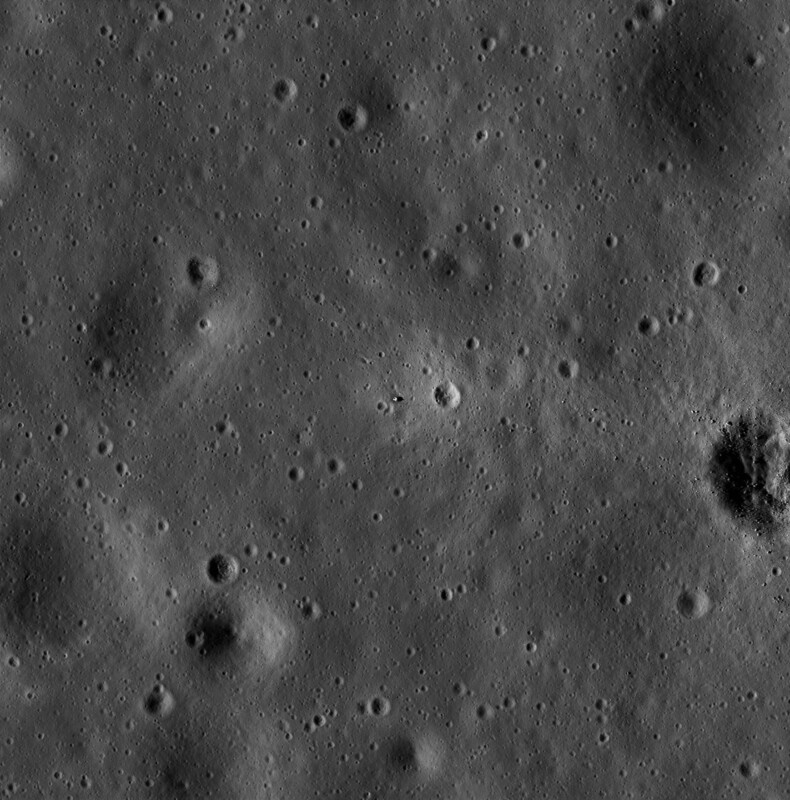 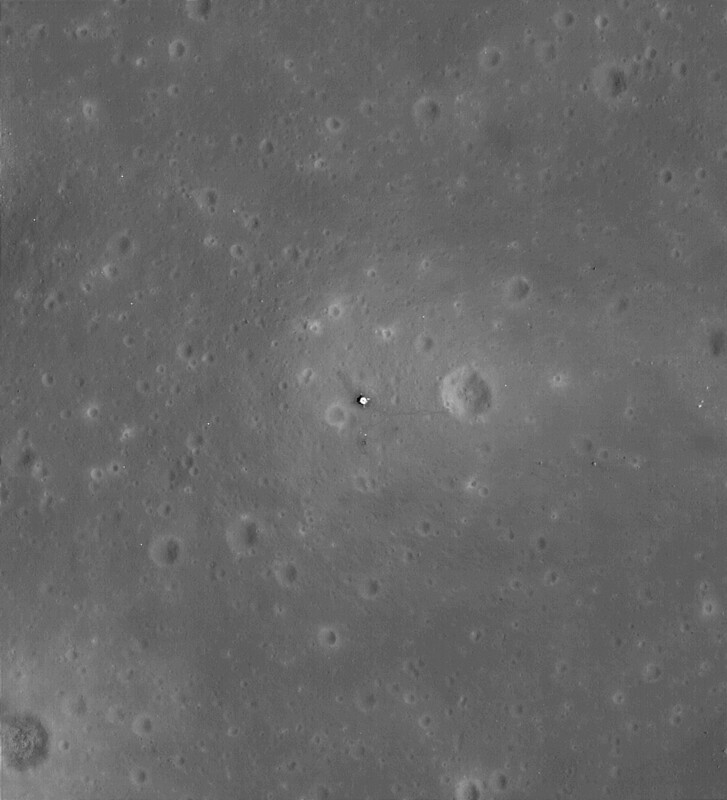 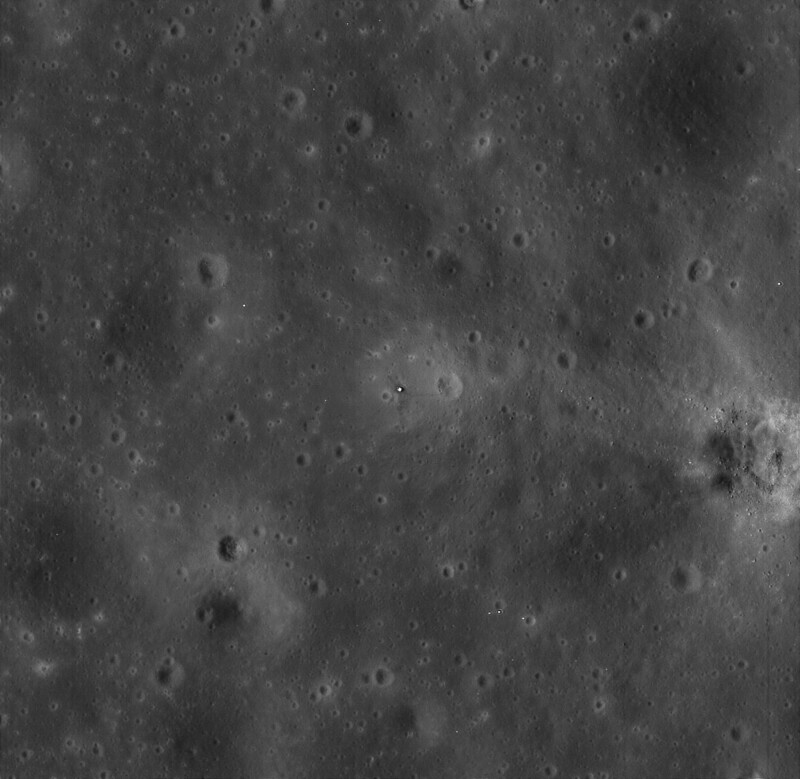 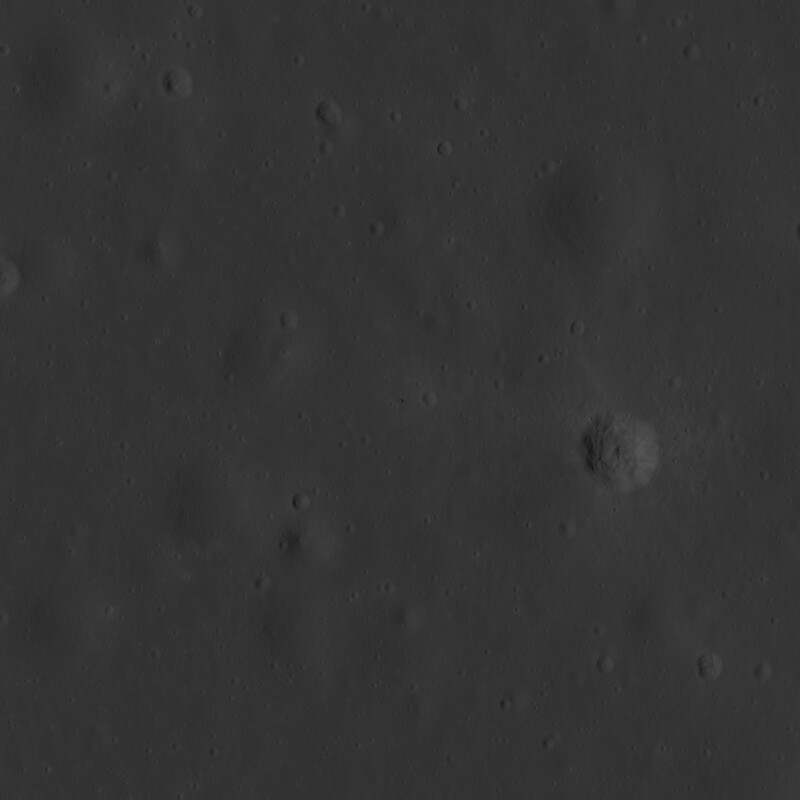 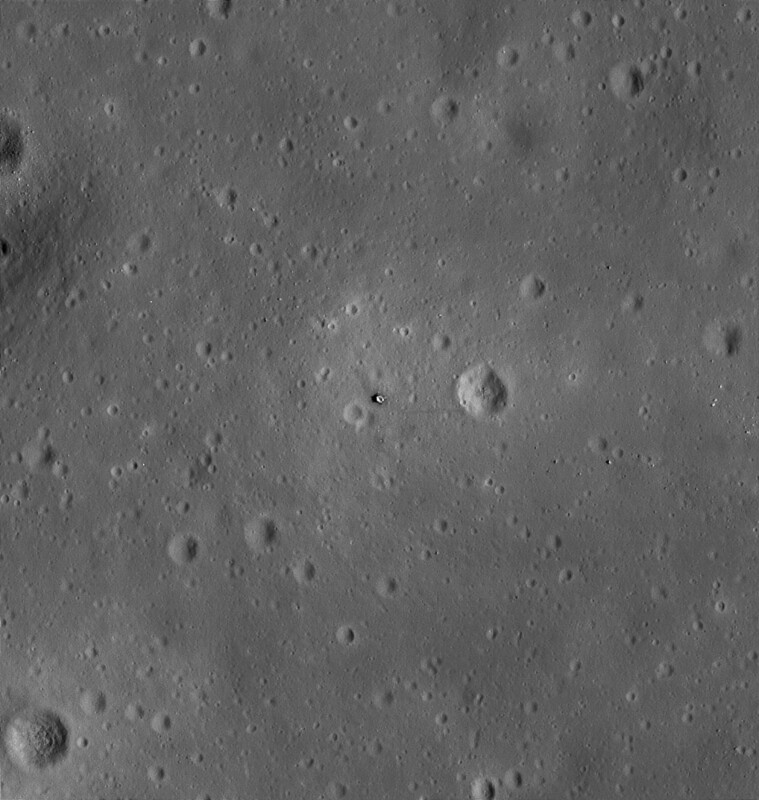 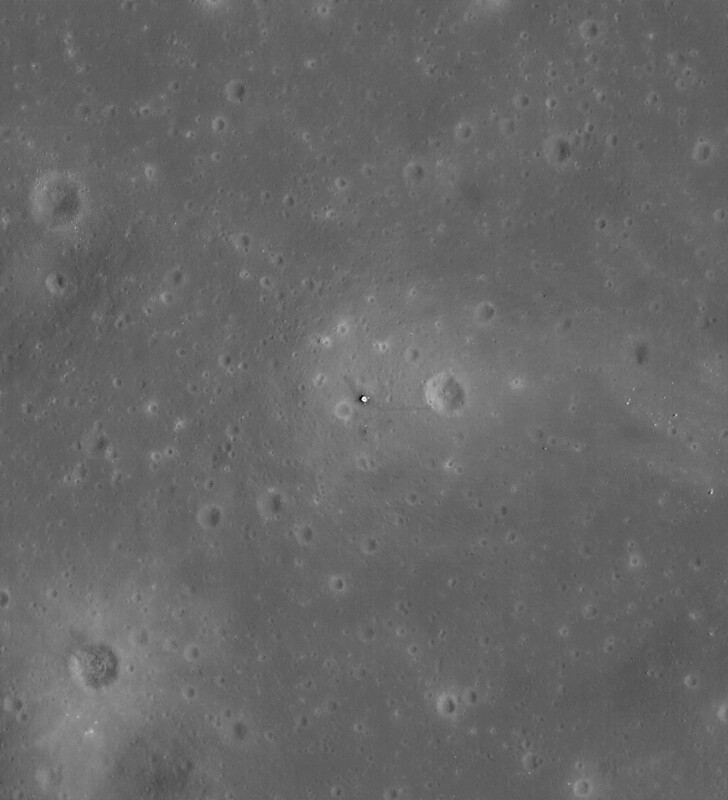 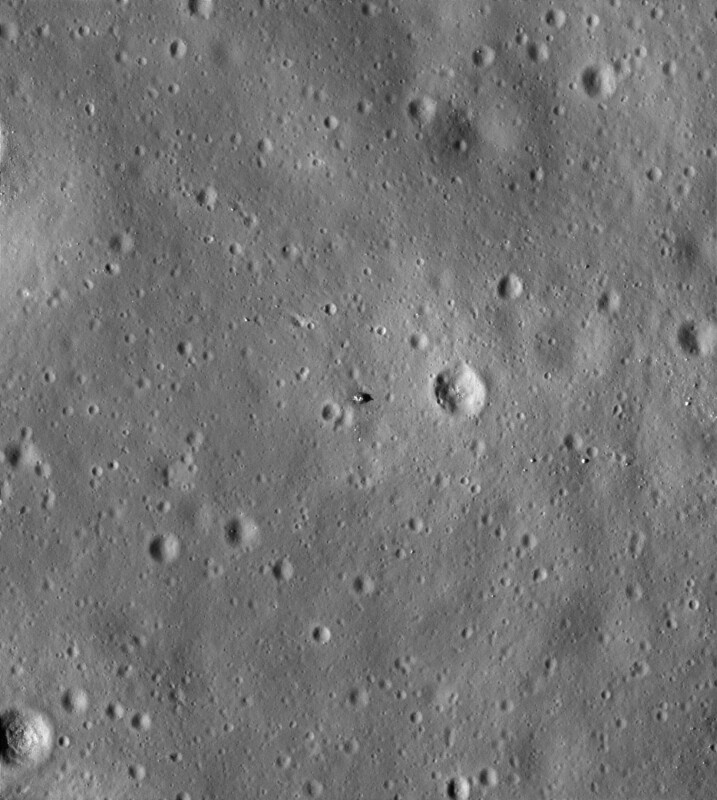 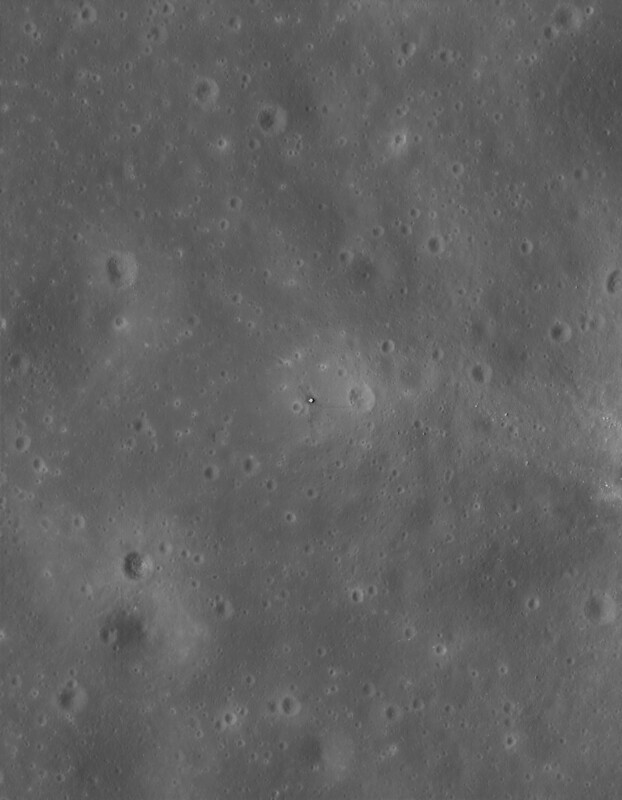 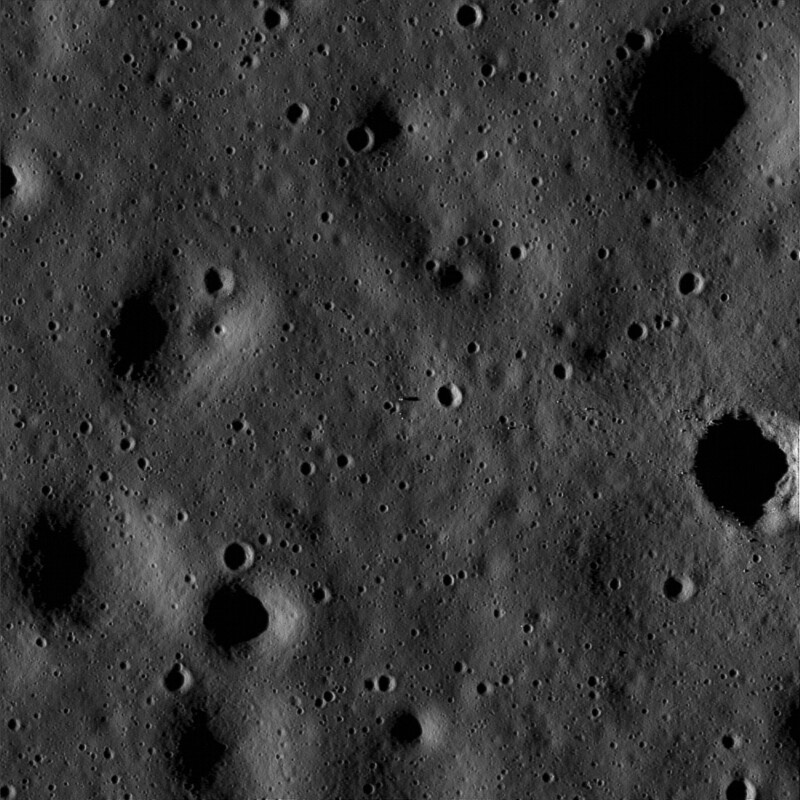 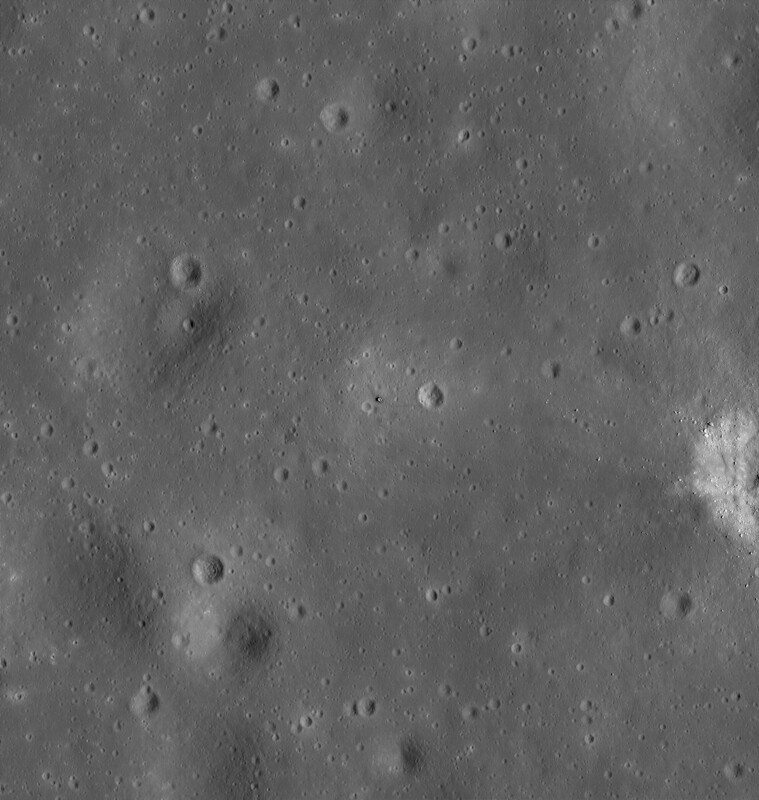 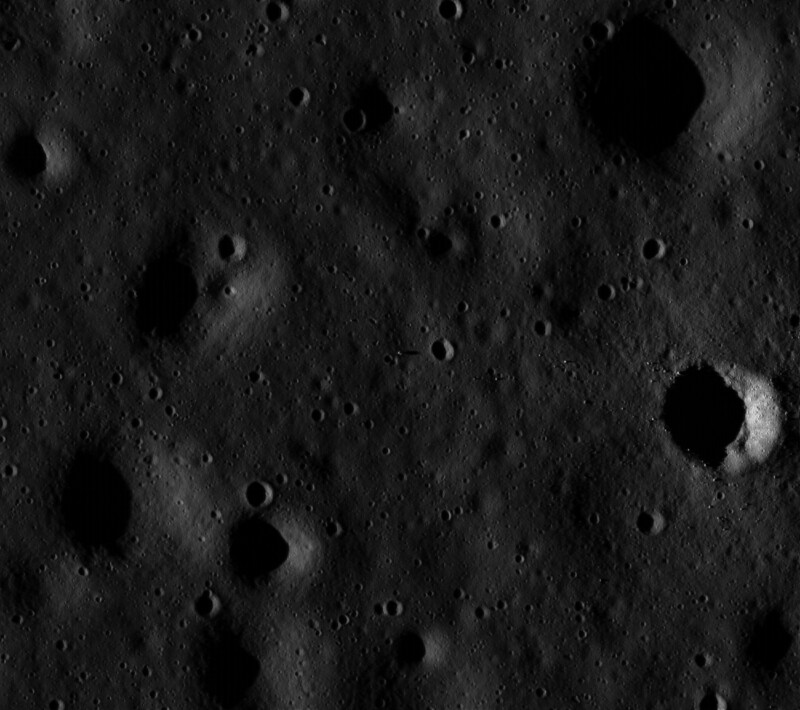 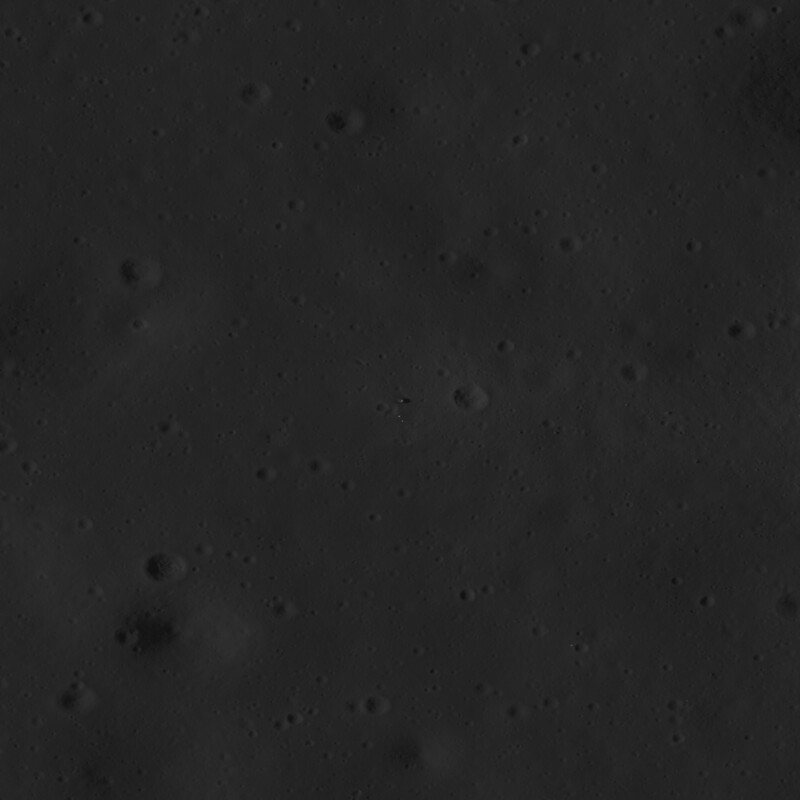 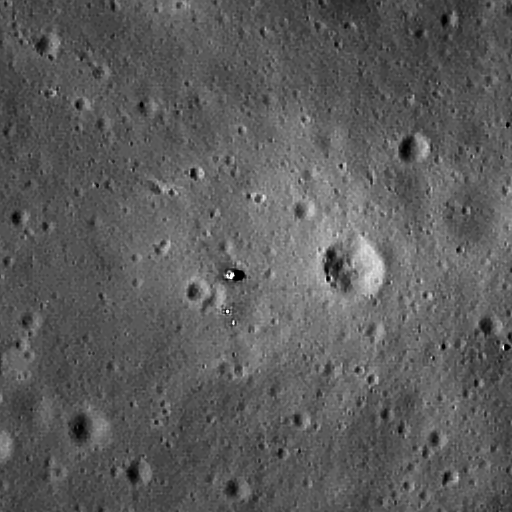 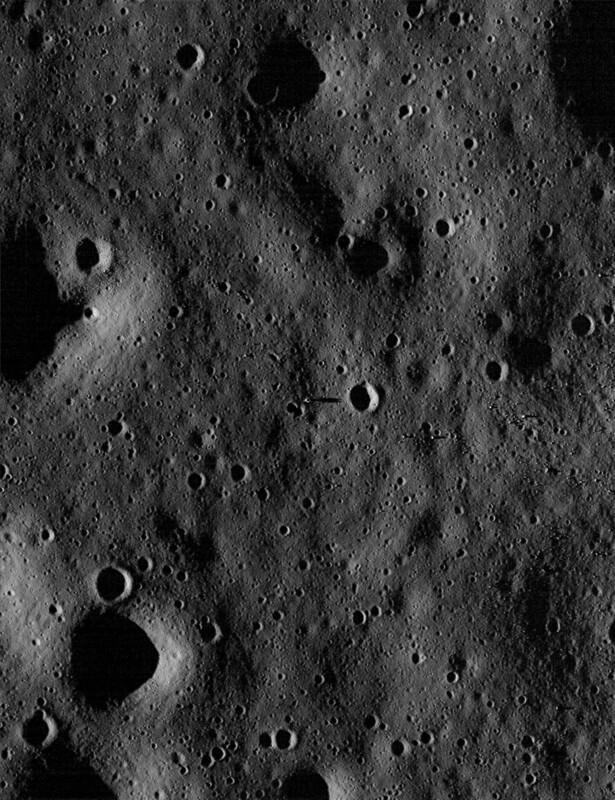 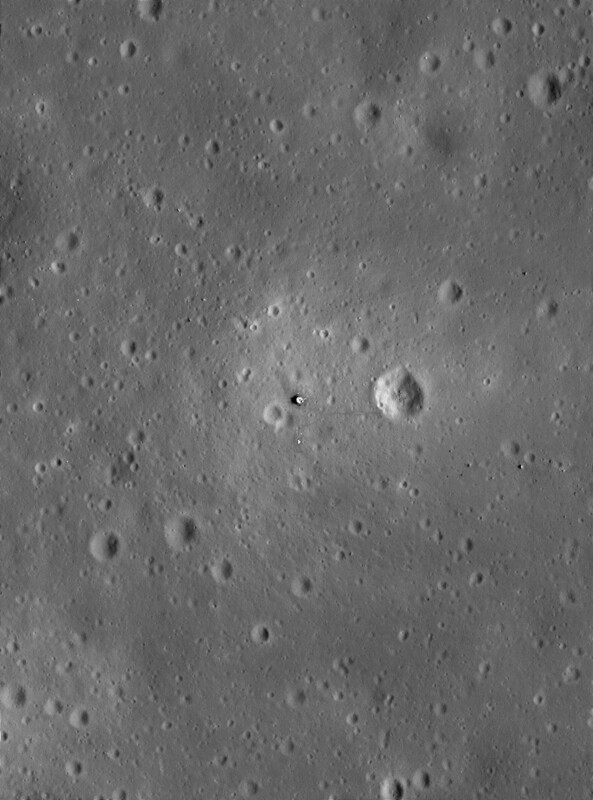 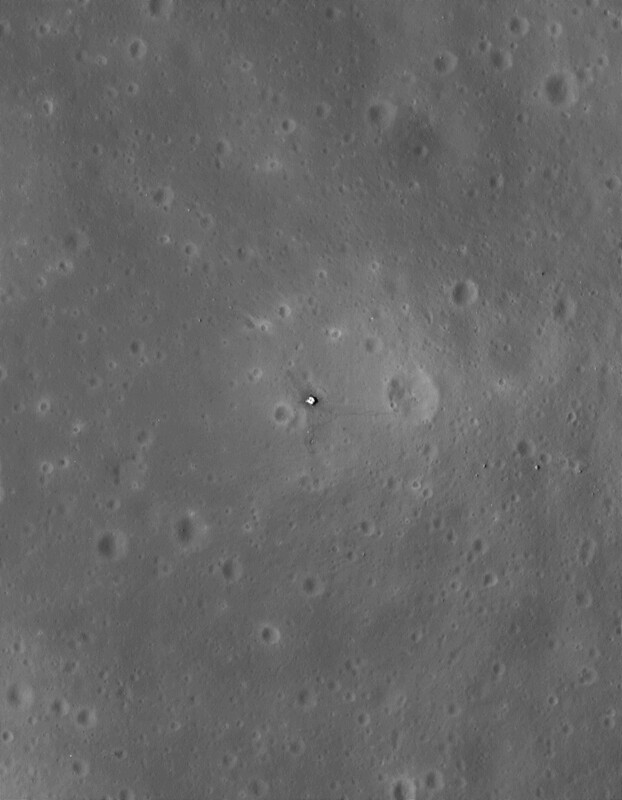 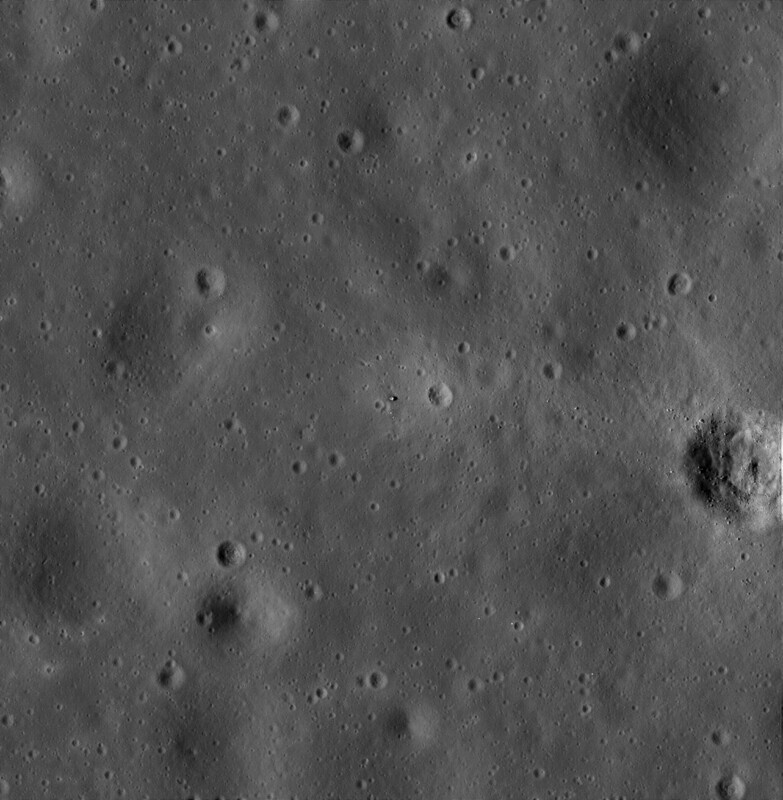 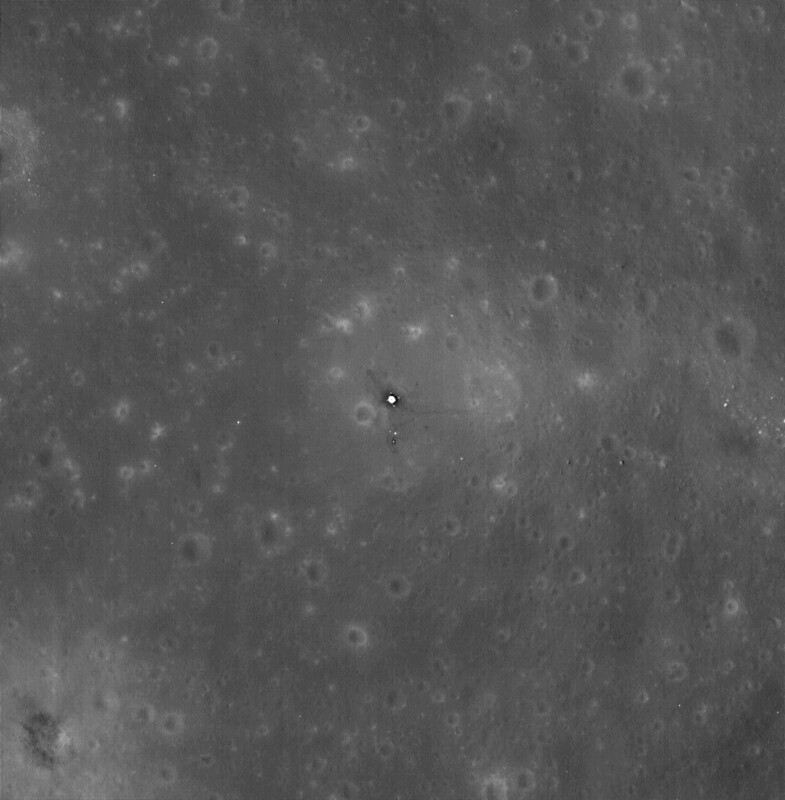 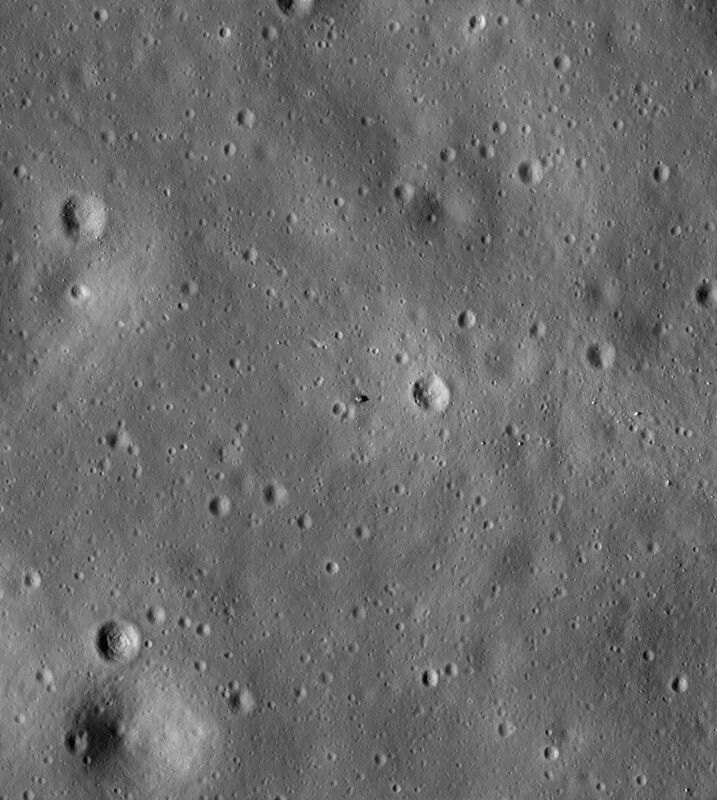 The LRO's true "first look", left, at the Apollo 11 landing site was taken approximately 4 hours before image M102014464RE. This image is noticeably sharper compared to the above image. 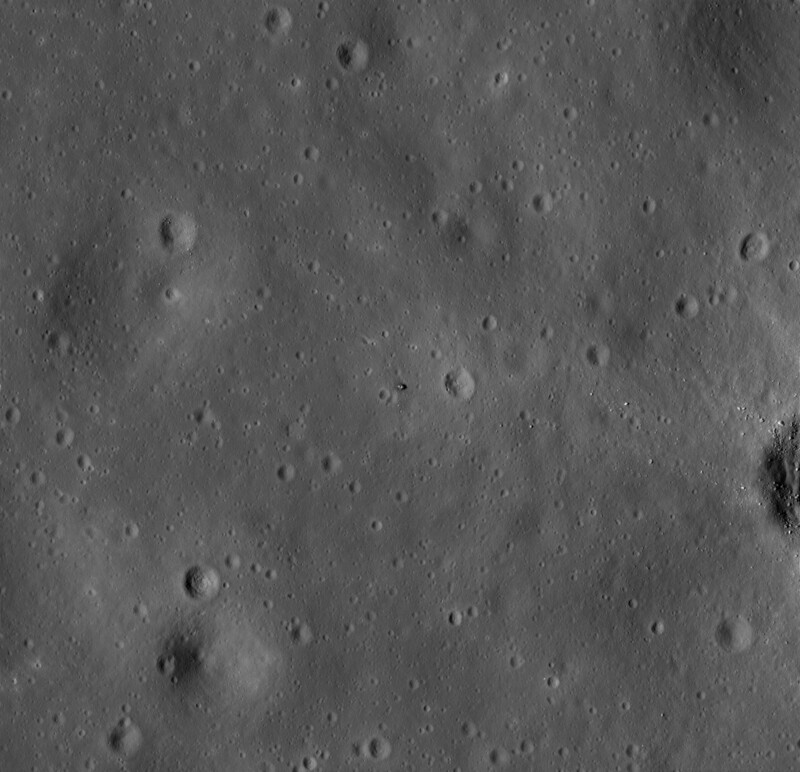 Sunlight reflecting off of the LRRR and PSEP is clearly visible in the deconvolved and enhanced versions of this image.  Decompanded, deconvolved and enhanced, 1.0 meters/pixel. 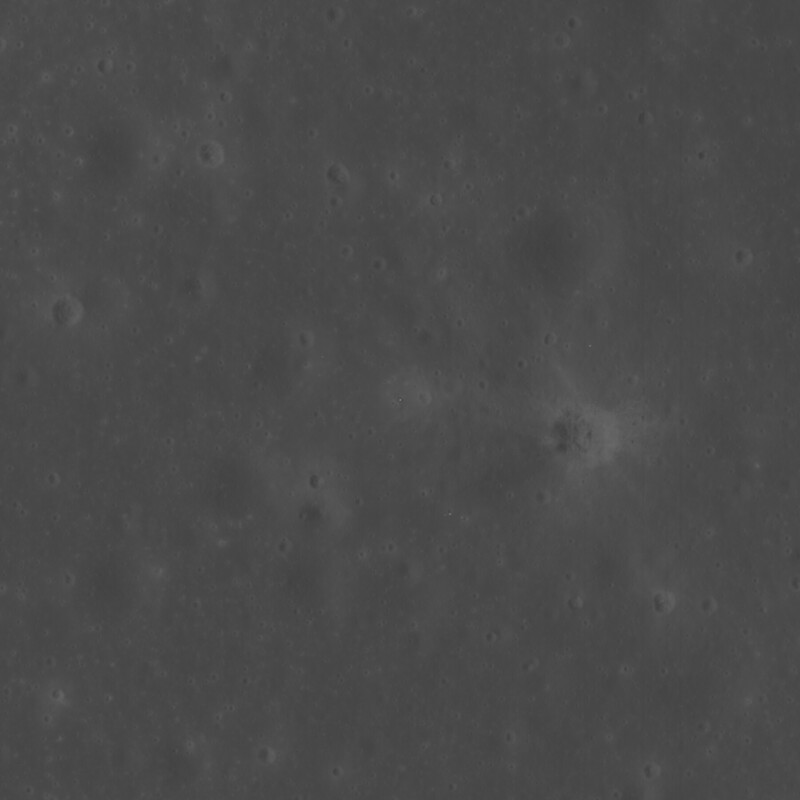 TIF Image Decompanded, deconvolved and enhanced, gamma curves applied, 1.0 meters/pixel.  Decompanded, deconvolved and enhanced, 0.5 meters/pixel. 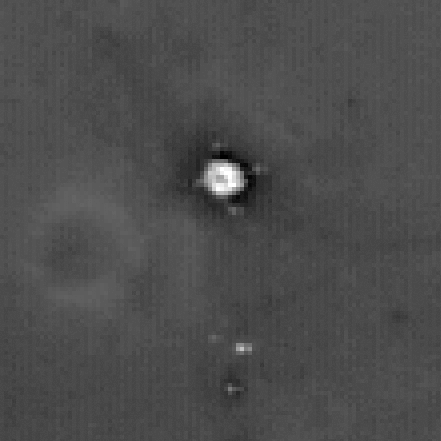 TIF Image Decompanded, deconvolved and enhanced, gamma curves applied, 0.5 meters/pixel. 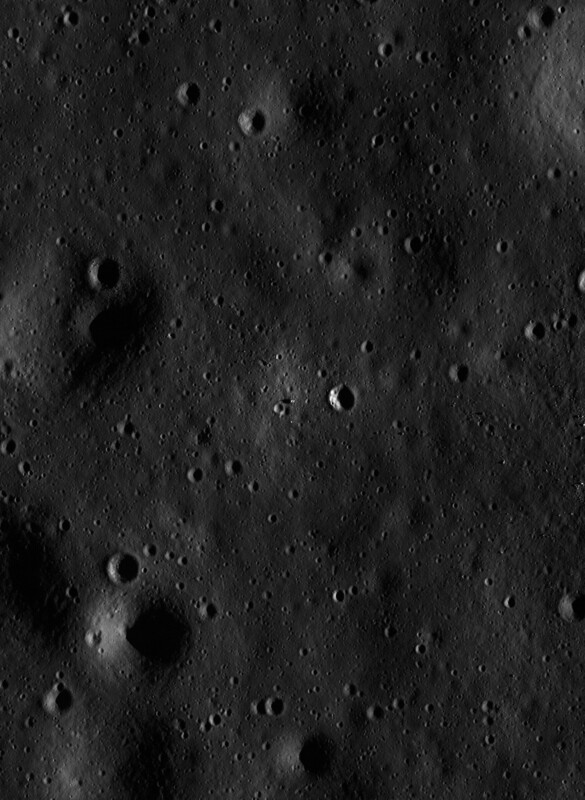 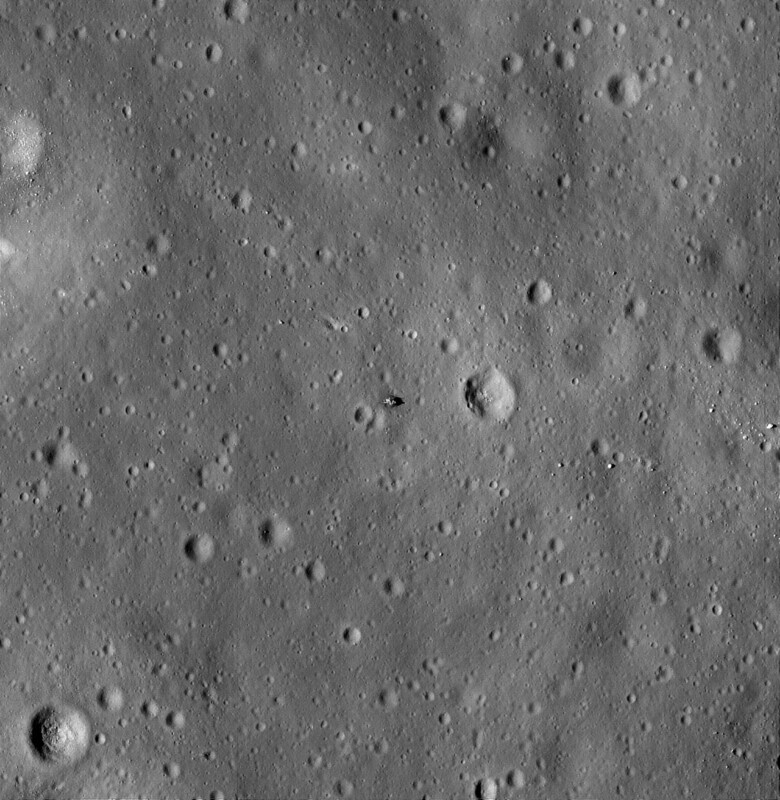 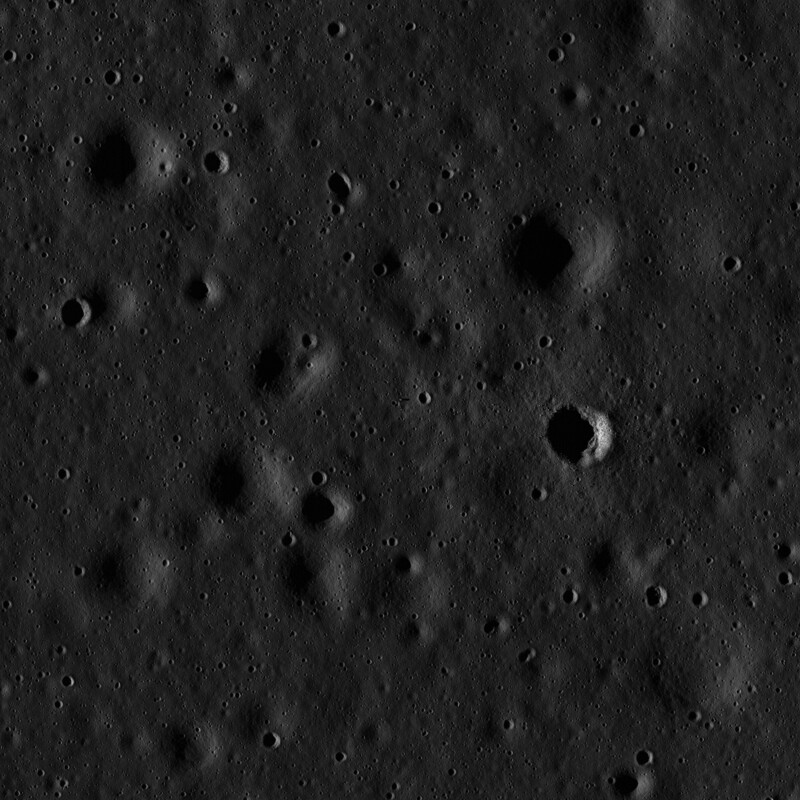 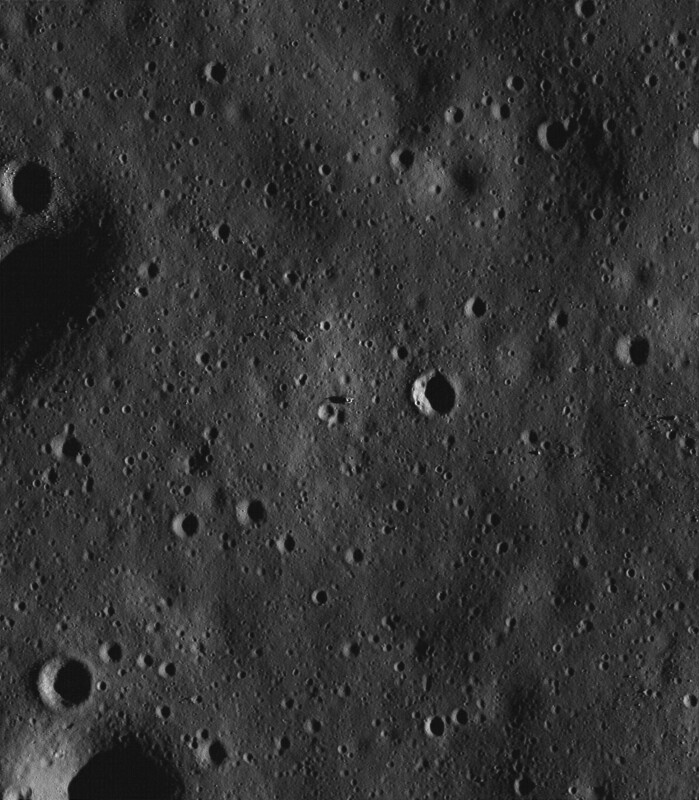 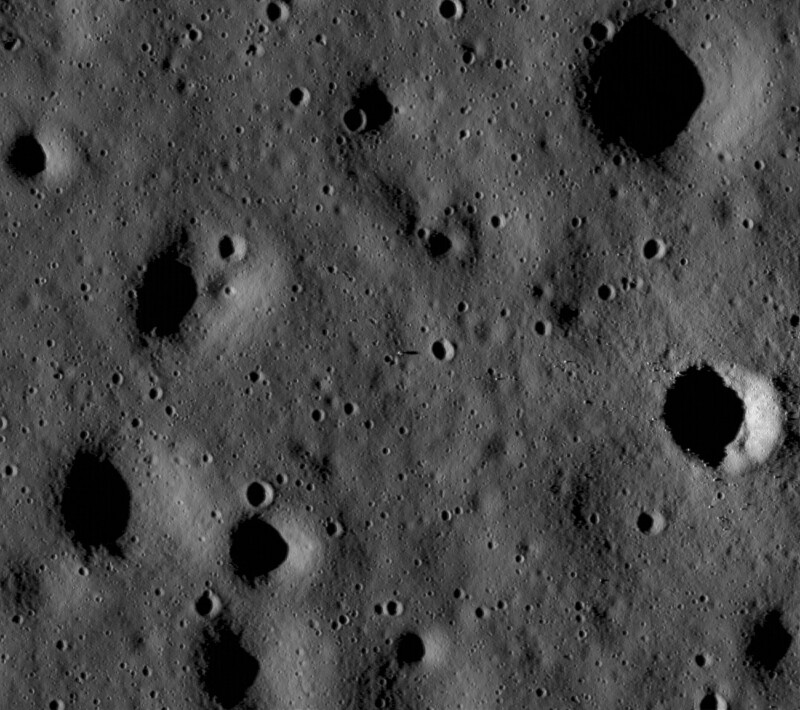 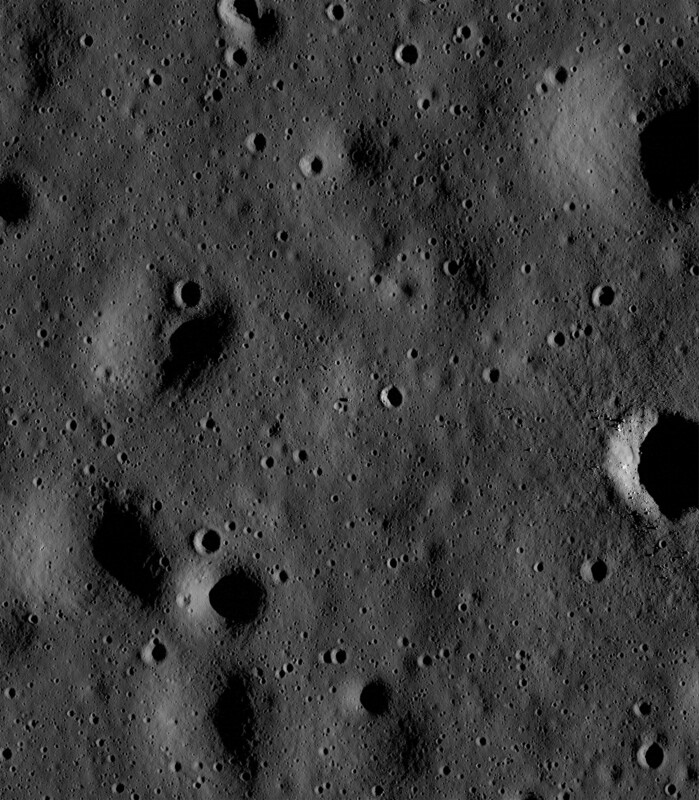 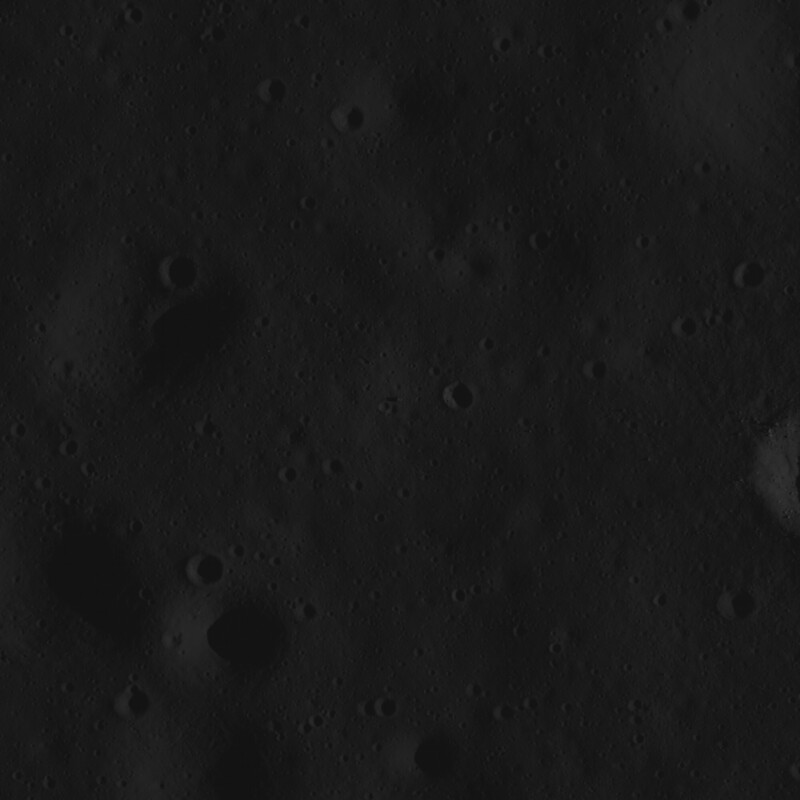 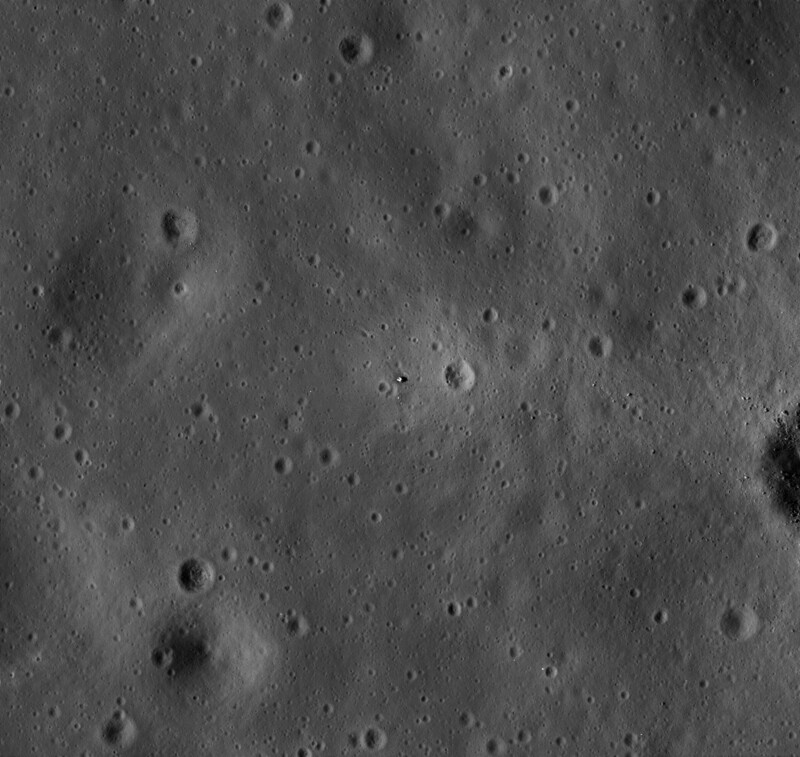 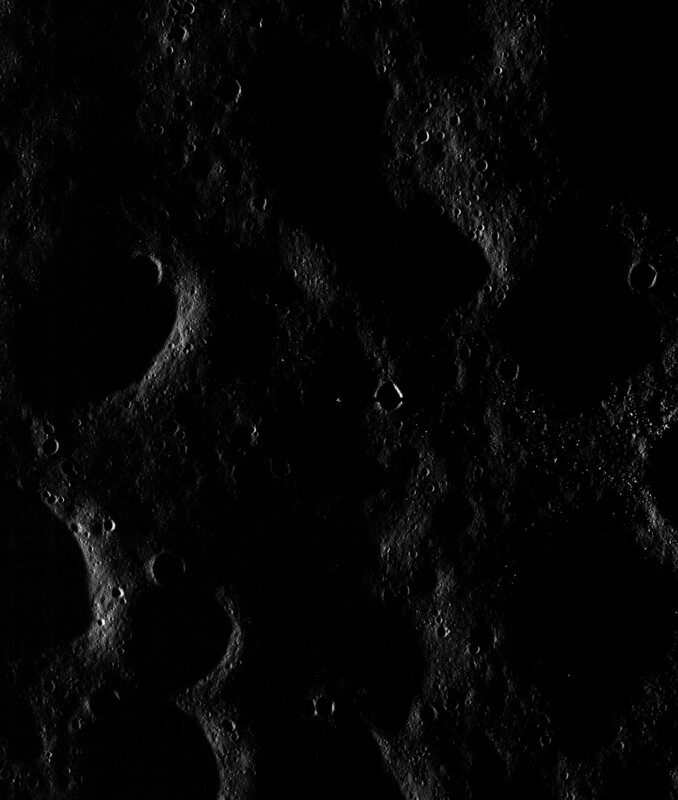 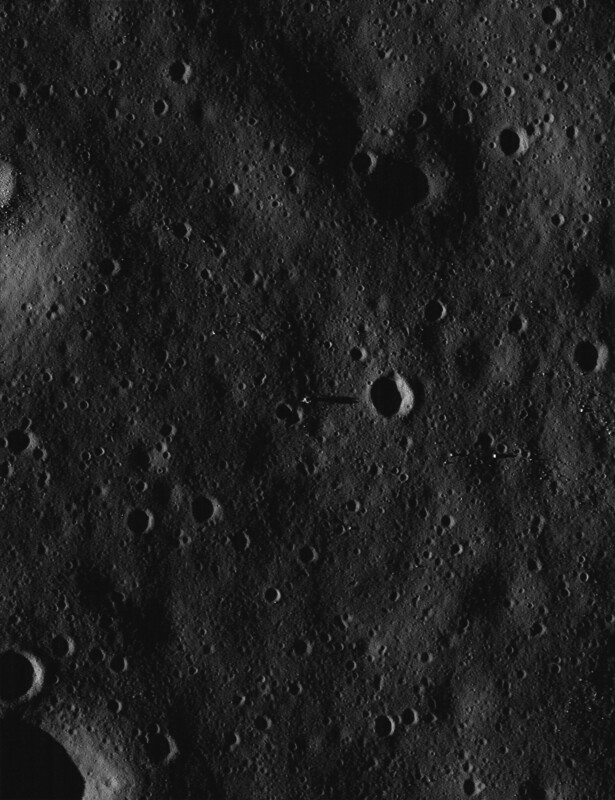 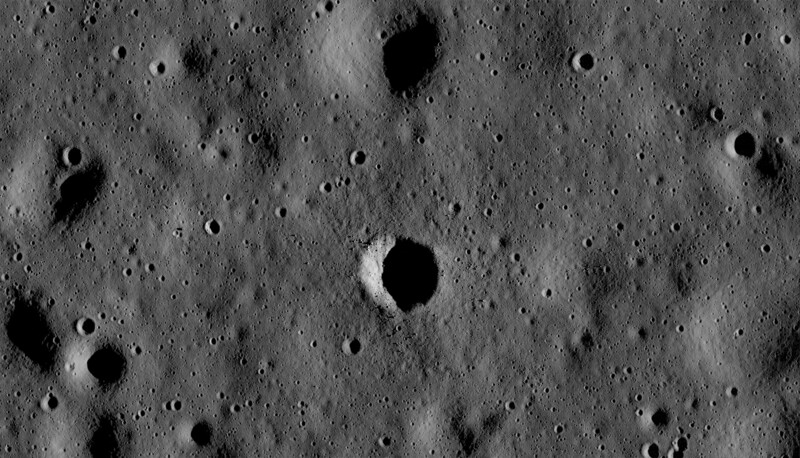 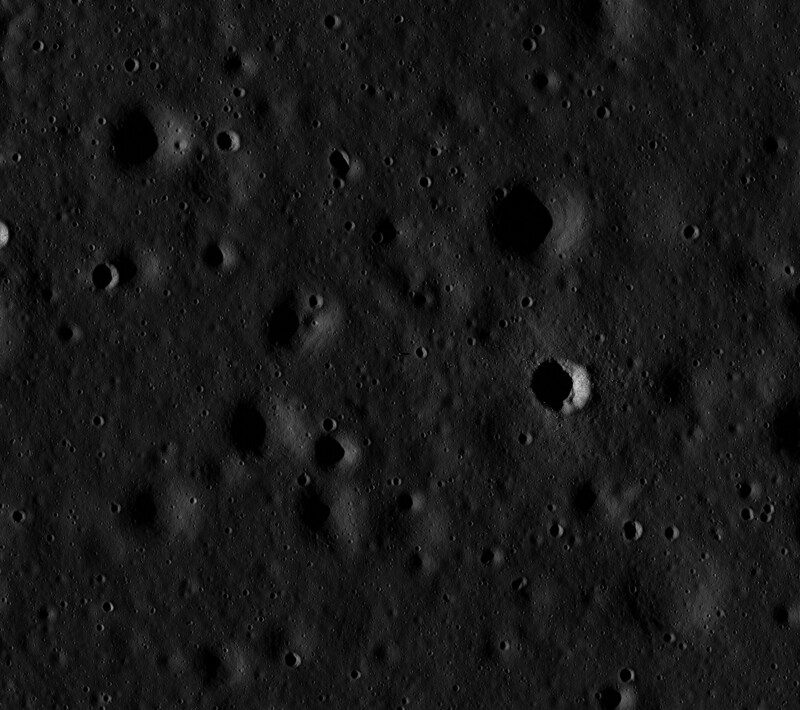 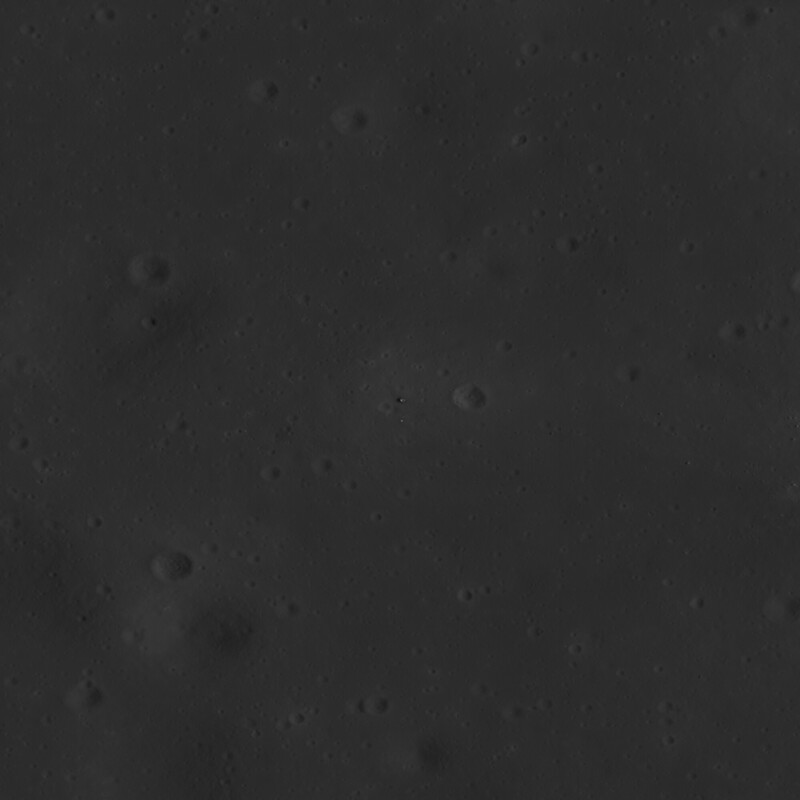 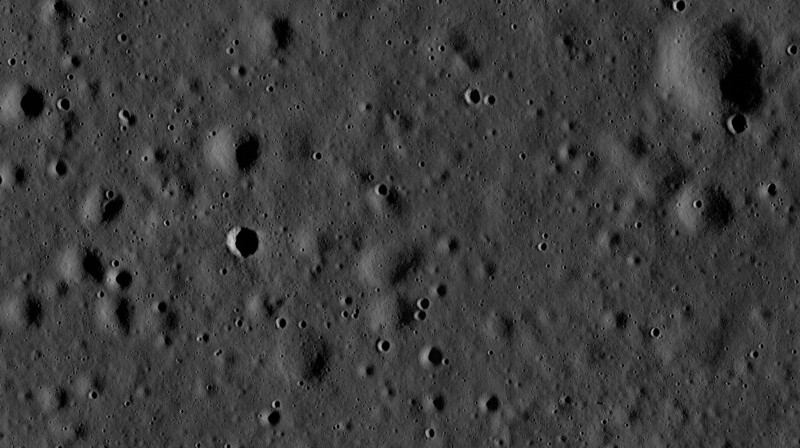 Cropped region of the raw LRO image. The ASU published LRO "First Look." 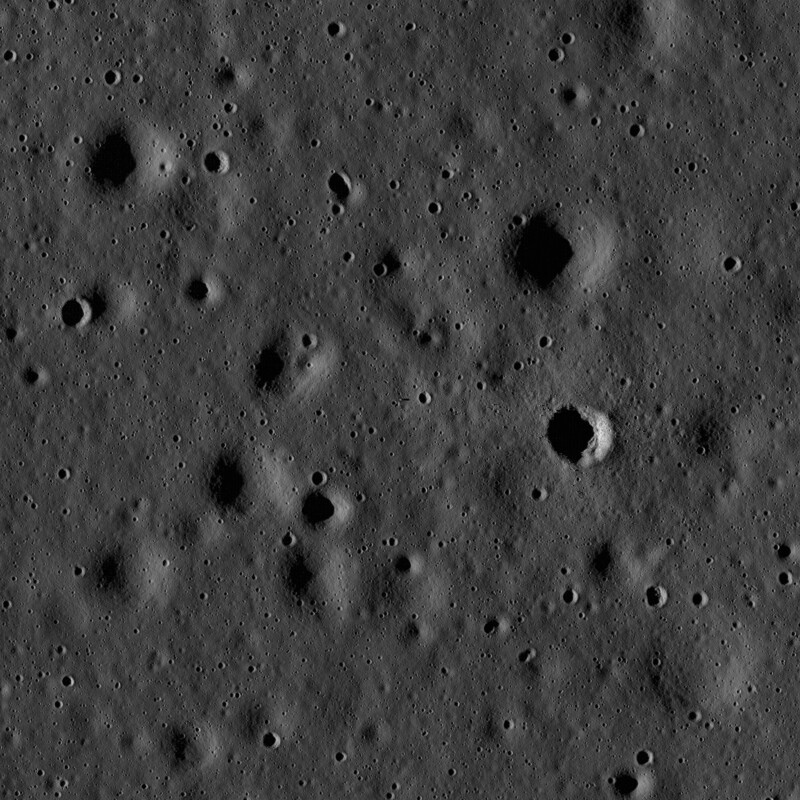 Decompanded and deconvolved version of the ASU published LRO "First Look" image. 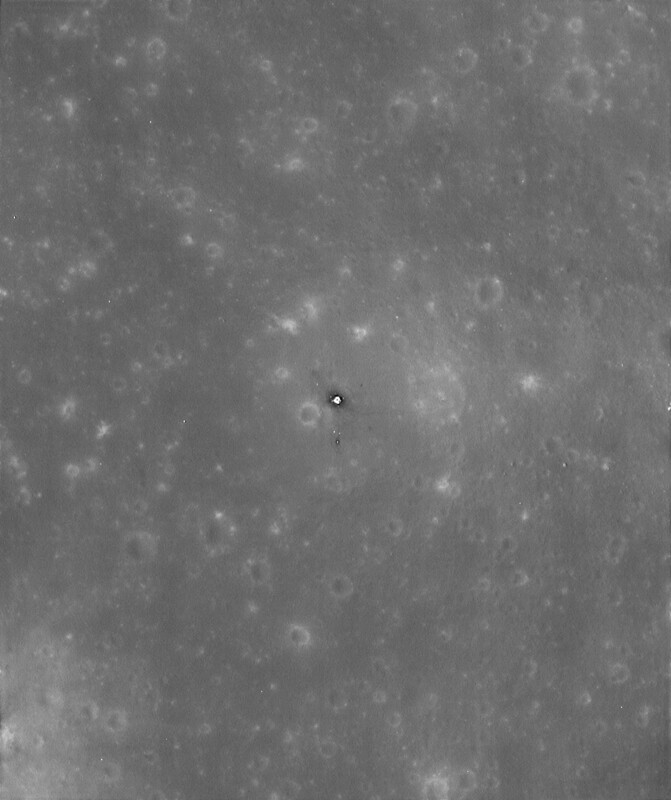 ASU published photo. 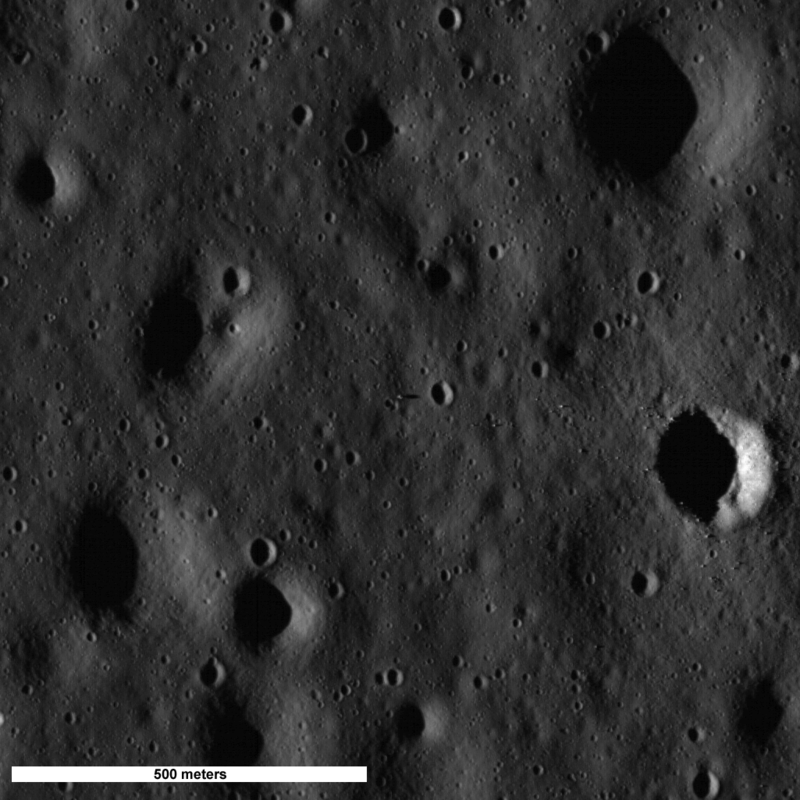 Decompanded and deconvolved version of ASU published photo. 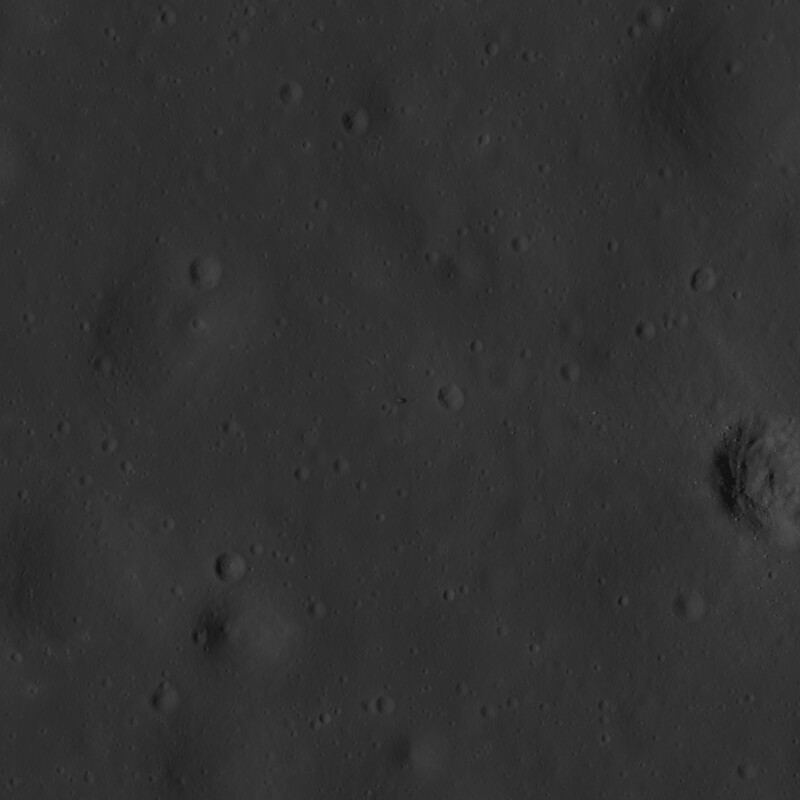 TIF Image Decompanded, deconvolved and enhanced, 0.5 meters/pixel. 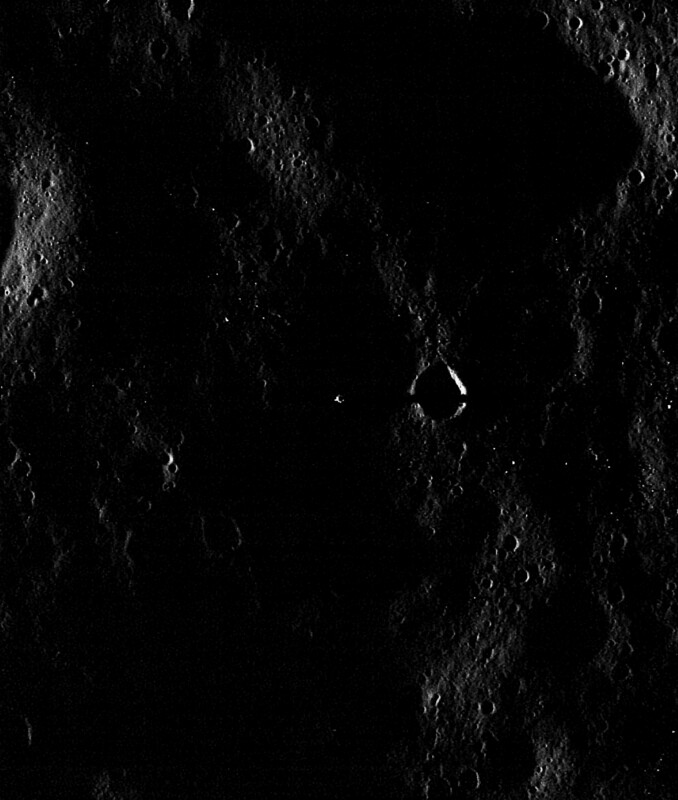 LM and West Crater. 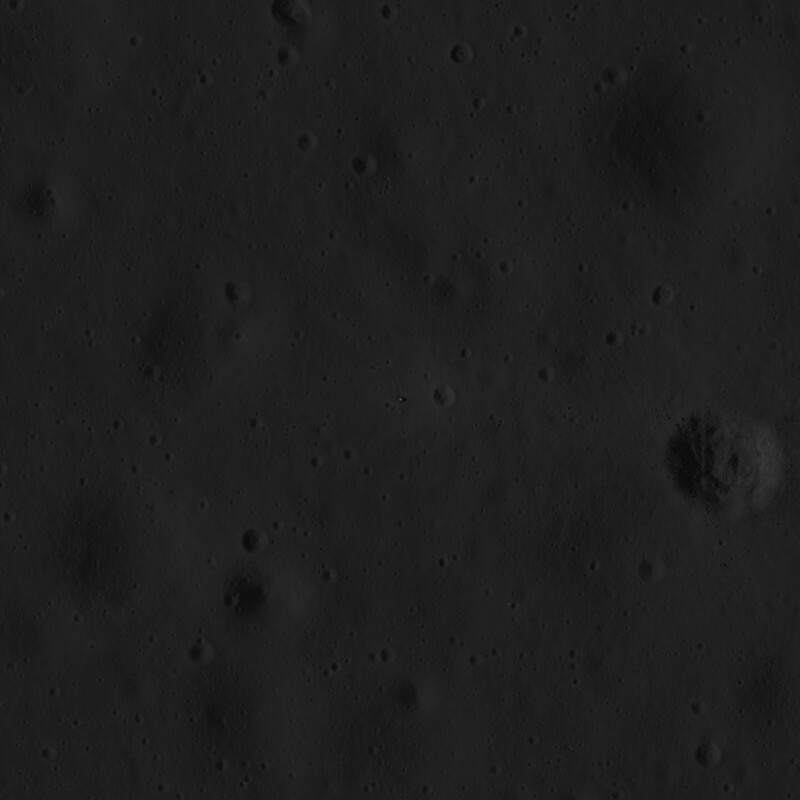 This image is similar to the above right image, except that this image shows a broader area and the image scale has been adjusted to 0.5 meters per pixel. 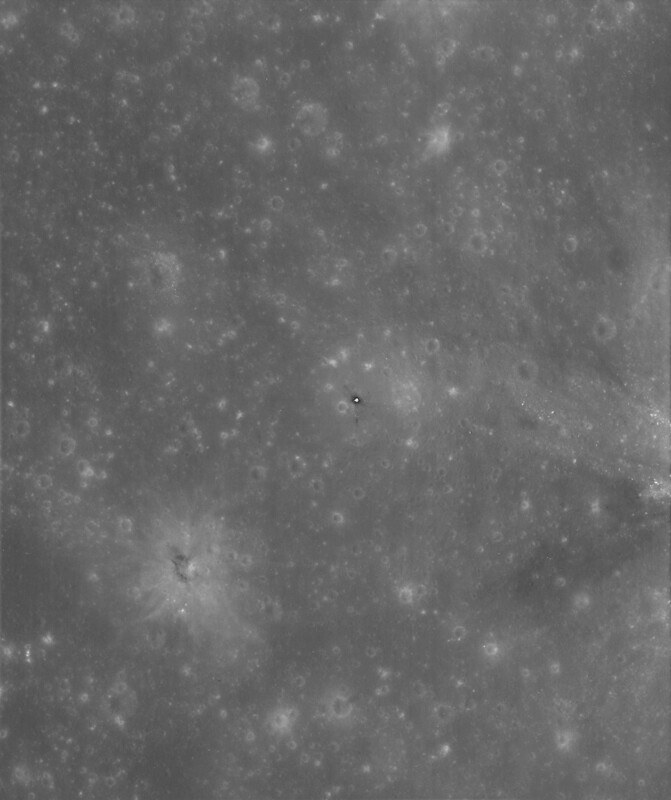 TIF Image Decompanded, deconvolved and enhanced, 0.25 meters/pixel. Full width crops of the left and right images, combined, deconvolved and enhanced, 1 meter/pixel. This combined image shows the terrain east of the landing site which was below the LM during the last 3 minutes and 47 seconds of the Eagle's landing approach. 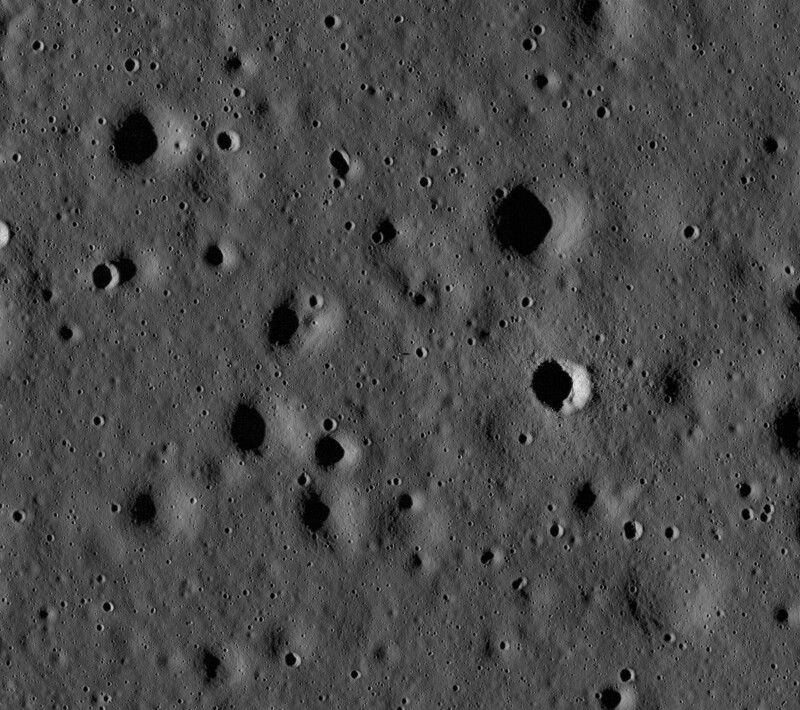 A closer and more strongly enhanced view of the terrain as the Eagle approached the final landing site, showing the boulder field surrounding West Crater. 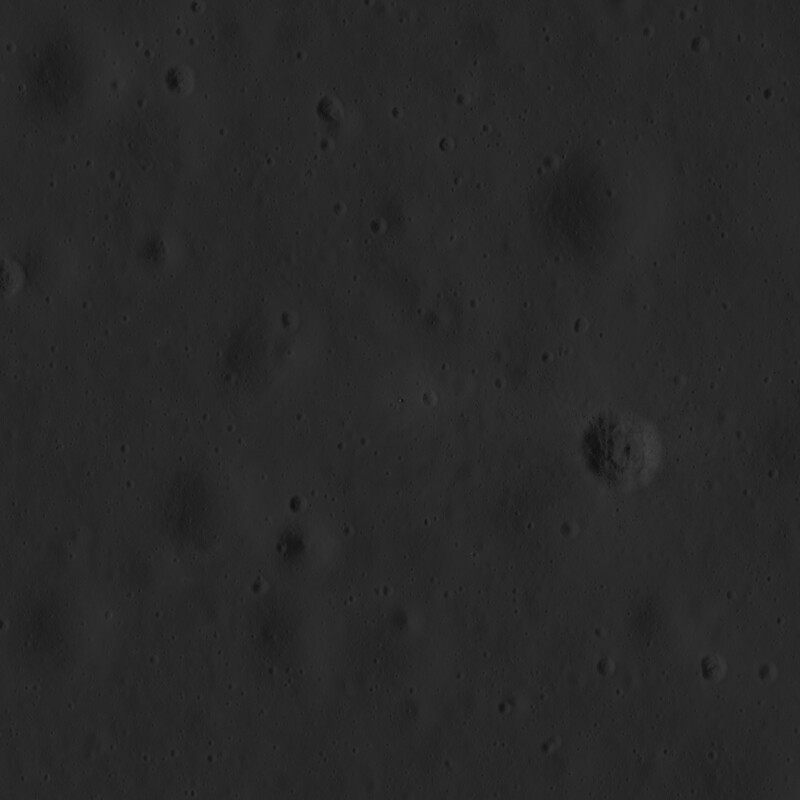 Image scale is 0.5 meters/pixel. 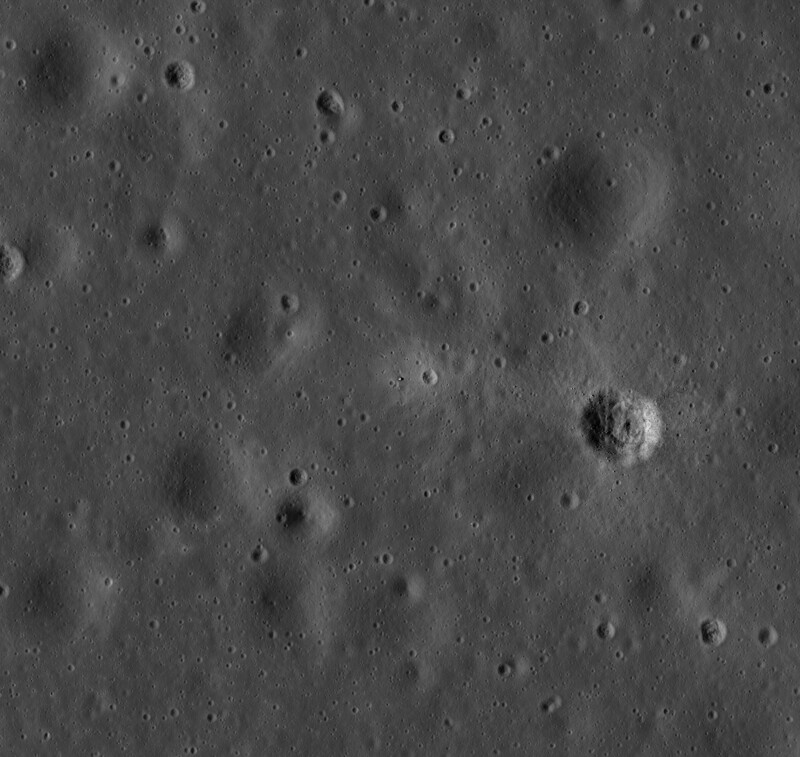 During the Eagle's descent, Armstrong's exclamation about a "boulder field" is perhaps the only moment during the Apollo 11 mission where Armstrong expressed any concern whatsoever regarding the success of the mission. 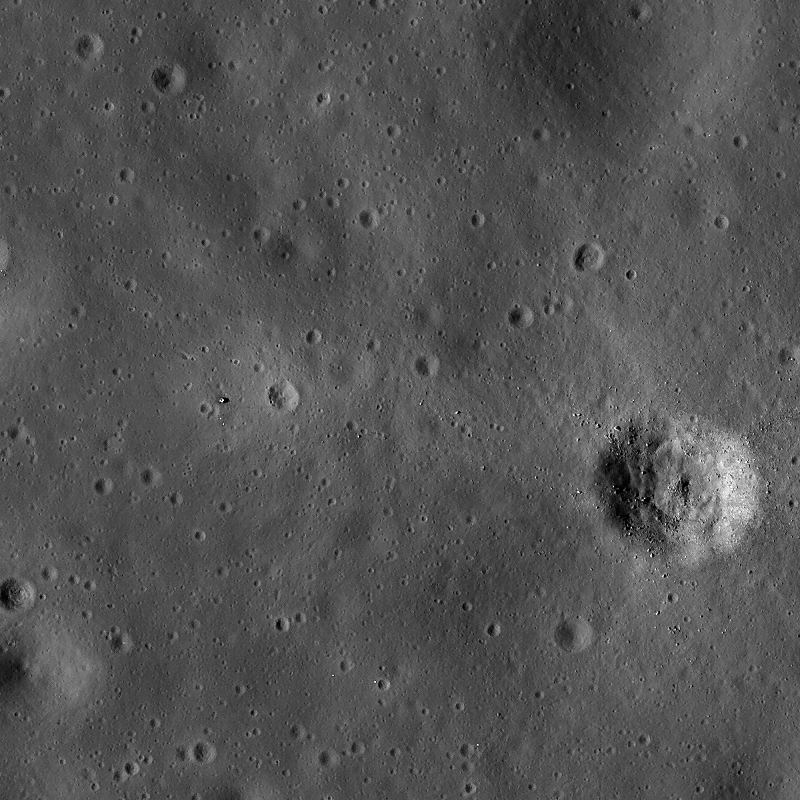 Any such concern was very short-lived since moments later Armstrong picked a suitably level landing site beyond the boulder field and a just bit downrange of Little West Crater. 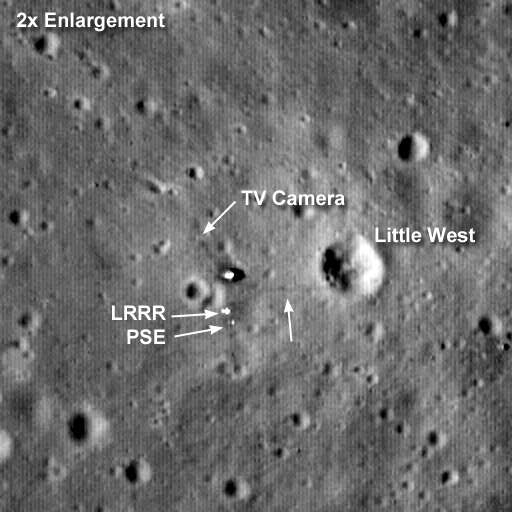 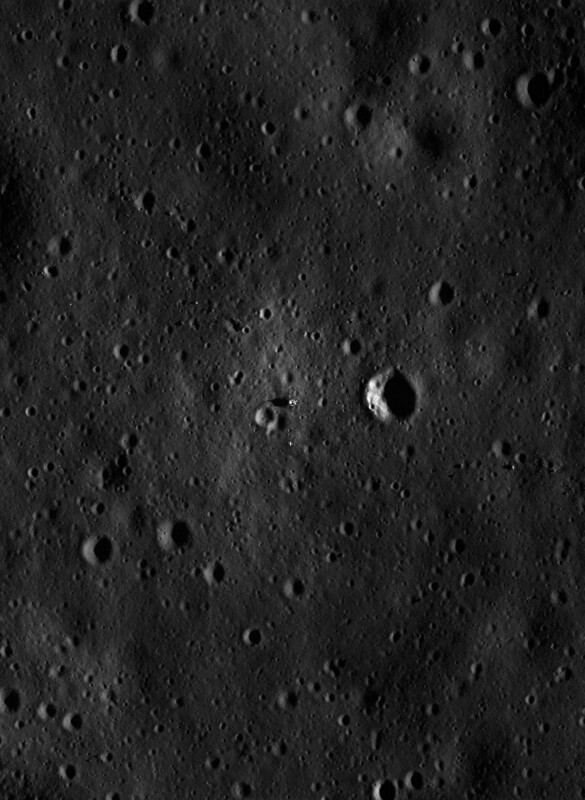 The raw LRO RE image. 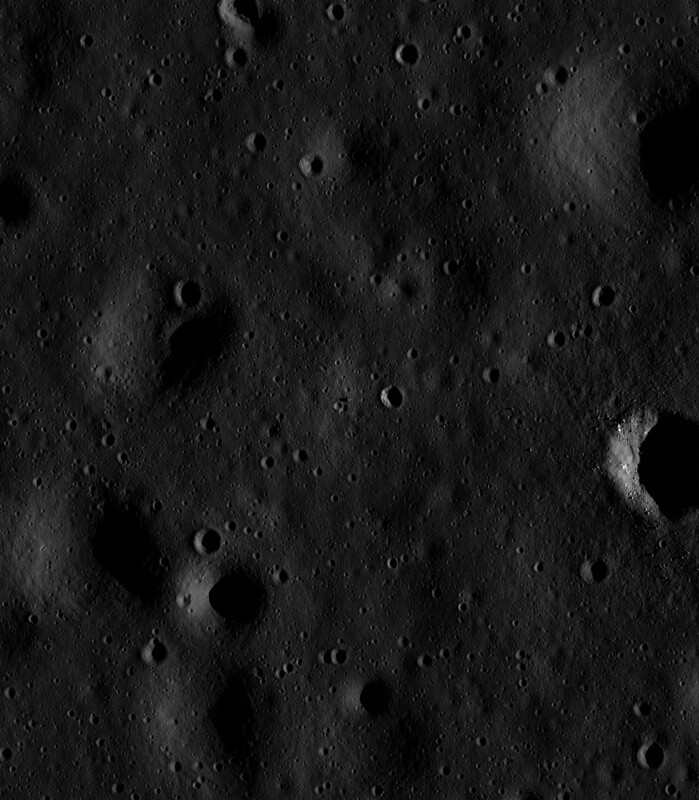 Decompanded, deconvolved and enhanced, 0.25 meters/pixel. TIF Image Decompanded, deconvolved and enhanced, gamma curves applied, 0.25 meters/pixel.  Decompanded, deconvolved and enhanced, gamma curves applied, 0.5 meters/pixel.